Thomas was born on 5 January 1840 at Greenhead, Haltwhistle, Northumberland to parents William Copeland and Elizabeth Pugmire. William worked with the standing engine at the pit. William was a local preacher, sometimes with the Wesleyans, and sometimes with the Primitives, as his location might determine. As a child, Thomas attended the services of both denominations. At the same time he also attend the Church of England service once every Sunday. When about thirteen years old, the family moved to Warwick Bridge, near Carlisle. There, in a revival service in the Wesleyan church, he gave his heart to God. He joined the Wesleyan Church for about two years and then joined with the Primitive Methodists. He began to preach when about sixteen years old. The young preacher was mentored by Rev Ralph Shields, who then recommended him for the ministry. After two stations in the south of England, the General Missionary Committee asked Thomas to go to Australia. During his ministry in Victoria, Thomas did a considerable amount of editorial work in the Connexional periodicals. For many years he was an examiner of ministerial candidates and probationers. He was President of the Annual Assembly on four occasions. During his superintendency, new churches were erected at Waterloo, Talbot and Moonee Ponds. 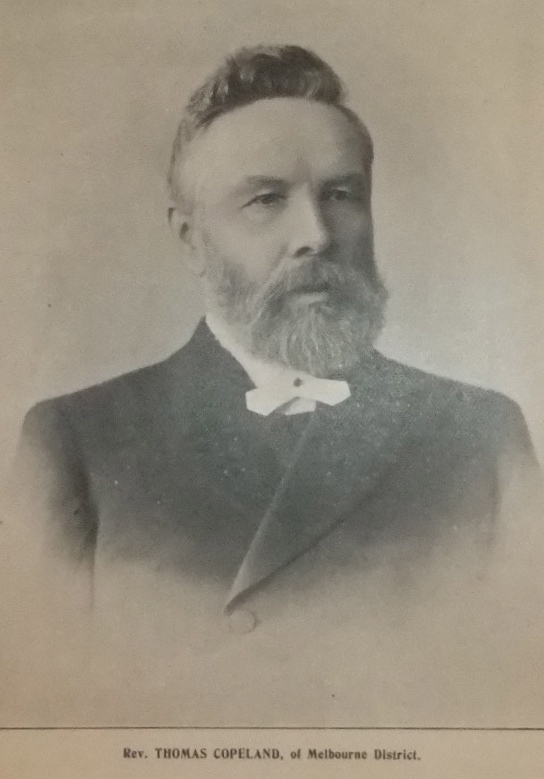 Thomas was one of the strong advocates of Methodist Union in Australia in 1902. He superannuated in 1910. Thomas married Mary Jane Young (1833-1904) on 7 October 1865 at Ballarat, Victoria, Australia. Records identify six children. Thomas married Jane Ware (1852-1933) in 1906. Thomas died on 9 April 1926 at Canterbury, Victoria, Australia. Thanks for identifying the typo. Thomas Copeland was the older brother of my great grandfather. I note with interest the information provided here. There is a small mistake – the death of Thomas’s son Arthur Graham Copeland occurred in 1954 rather than 1854. Also Thomas served in three British circuits, including Ryde and Ventnor station on Isle of Wight which is where he met his future wife, Mary Jane Young. Williamstown 1904 St Kilda 1907 Lilydale 1908-10 retired to Hawthorn Canterbury Melbourne.There is a stained glass window dedicated to Rev Thomas Copeland in the Balwyn Road Uniting church, Canterbury, Melbourne.